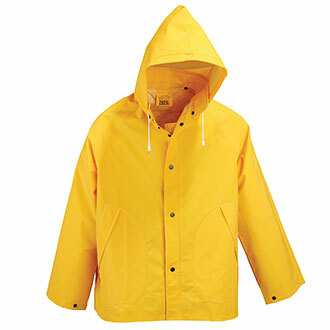 30" PVC Vinyl Rain Jackets are an excellent value! Ya know its not bad rain gear for the price. I paid $9.15 for a large with free shipping. The material is sort of heavy and it sheds water just fine. If stressed and pulled it will tear. Just wearing it to not get wet is fine. Based on the Price I cant be too disappointed on the Neese Rain Jacket with Hood, BUT... - 3M Scotchlite Reflective Striping I DO NOT SEE ANY 3M STRIPING. - Badge tab NO BADGE TAB. - Hook and Loop cuff adjustments THE SNAPS ON THE CUFF ARE ALL OVER THE PLACE. ONE WAS JUST BARELY ON THE EDGE OF THE SLEEVE. YOU CAN SEE WHERE THEY WERE SUPPOSED TO BE PLACED, BUT NONE WERE IN THE CORRECT SPOT. - Fleece lined THE LINING IS POLYESTER. NOT WHAT I WOULD CALL FLEECE.